Heat the oven to 400°F. Beat the egg and water in a small bowl with a fork. Stir the sugar and cinnamon in a small bowl. Sprinkle the work surface with the flour. Unfold 1 pastry sheet on the floured surface. Brush the pastry with the egg mixture and sprinkle with 2 tablespoons sugar mixture. Starting at both short sides, fold the pastry toward the center, leaving a 1/4-inch space in the center. Brush with the egg mixture and sprinkle with 1 tablespoon sugar mixture. Fold one side over the other, making a 4-layer rectangle. Repeat with the remaining pastry sheet. Cut each rectangle into 12 (3/4-inch) slices, making 24 slices in all. Place the slices cut-side down, 2 inches apart on baking sheets and brush with the egg mixture. Bake for 12 minutes or until the pastries are golden brown. Remove the pastries from the baking sheets and cool on wire racks. 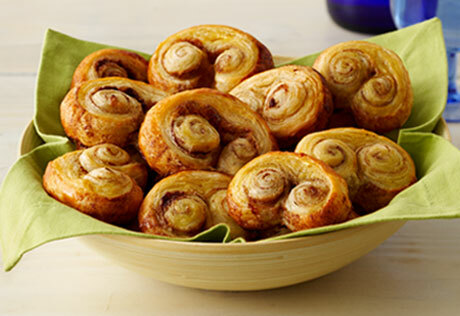 For chocolate-drizzled pastries, drizzle the pastries with melted chocolate. For walnut pastries, sprinkle 1/3 cup finely chopped walnuts over the sugar mixture on each pastry sheet before folding. For chocolate peanut pastries, omit the sugar and cinnamon. Sprinkle 2 tablespoons each mini semi-sweet chocolate pieces and finely chopped peanuts on each pastry sheet before folding.